The BBC Folk Awards ceremony at the Royal Albert Hall was totally sold out. The proceedings were broadcast live from all the BBC Radio stations from 8pm, via the red button, and online, with video highlights to follow on 25th, 26th and 27th February again on the red button. Various guest stars performed including Bellowhead, Suzanne Vega, the Full English and the Fishermen's Friends. There was a special appearance by Peggy Seger, Pete Seger's sister. Apart from Hattie and Mischa, the other two Young Folk award nominees were: Gentlemen of Few - a bluegrass quartet, and Granny's Attic - a trio. Hattie is friends with them all and they will be appearing at various festivals around the country over the summer. Click this link to listen to the interviews: http://www.bbc.co.uk/programmes/b03x4f21. The Young Folk Award was won by the Mischa McPherson trio. They are keeping the tradition of celtic folk music alive and sing in Gaelic. They are all fantastic instrumentalists, and Mischa has a wonderful voice - very worthy winners. This is the link to the Young Folk Award documentary - http://www.bbc.co.uk/programmes/p01s4vmt. 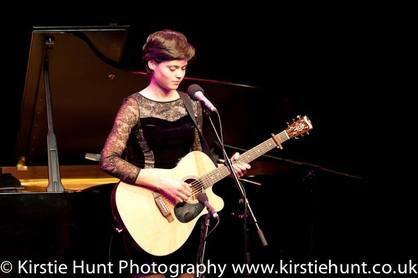 These photos of Hattie on stage at the Brewery Arts Centre in Kendal have been supplied by Kirstie Hunt Photography. 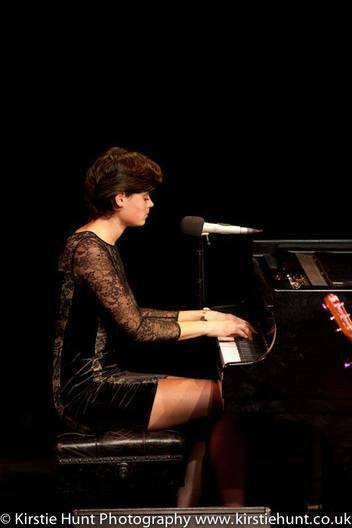 Hattie played two songs on this piano - a stunning Steinway, and one on her guitar to an enthusiastic and knowledgable audience.